Welcome to Ventana Del Mar! For those of you looking for a true Costa Rican experience without the hustle of vacation resorts and tourist traps, you’ve found the right place. This unique custom home is nestled in the trees resting above Carrillo Bay. The open air design brings cool ocean breezes and plenty of sunlight. All of the bedrooms are fully appointed with air conditioning units and ceiling fans. 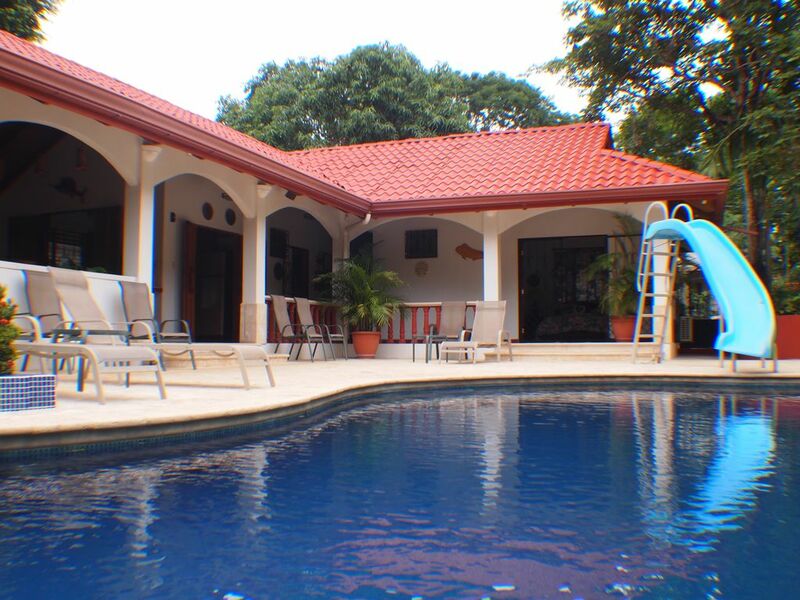 Our home is centrally located in the small fishing town of Puerto Carrillo. It is walking distance to the local tiendas (groceries), restaurants, pizzerias, cafés, and of course THE beautiful beach. Carrillo Beach was rated among the top 25 hideaway beaches in the world in Travel and Leisure magazine 2011. Samara is the next beach town 10 minutes away and provides more shopping, restaurants, surfing and adventure tours. Playa Carrillo is one of the most desirable beaches in Costa Rica. This 2-mile long white sand beach is lined with palm trees that provide plenty of shade. And, is void of commercial development. No bars, no hotels, no restaurants, just like its supposed to be with a few locals selling coconut milk or a push cart with sno-cones. Many mornings you can walk the entire beach and see only a handful of people. Carrillo’s horseshoe bay is protected from the rolling Pacific waves by a coral reef which is available for snorkeling at low tide. The waves are usually very playful with no undertow, making it perfect for all ages. Surfers looking for bigger waves can go to Camaronal, the next beach south. Returning from the beach, you can rinse off in the outdoor shower and relax in our private infinity pool. The pool includes a swim up palapa bar with a mini-fridge for drinks and a gas barbeque grill. There is also a cool water Jacuzzi and a waterslide for kids of ALL ages. The main house offers an open air environment in the Great Room and Dining area and a large, fully equipped kitchen with pass-through breakfast bar. It has 3 bedrooms and three baths that sleep up to 7 people, and there is an additional apartment next to the house with two more bedrooms, bath and a full kitchen. Additionally, there are 5 futons throughout the complex. Our on-site managers, David and Lesdy Ortega, will provide the conveniences of daily pool maintenance and light cleaning. Additionally they own Samara Tours and can provide airport shuttle transportation as well as arrange various sea and land excursions. As you can read in the reviews of our house, they will enhance your experience in every way. Convenience is key when planning an exciting vacation. Getting to this pristine location is surprisingly easy. If you fly into Liberia International Airport, you can rent a car or charter a Samara Tour van to take you the 1.5 to 2 hour drive. The road is paved the entire way to the house, which is quite a luxury for Costa Rica. If you are flying into San Jose, the drive is usually just under 4 hours. Flying from San Jose is 35 minutes on the local commuter airline, Sansa, which lands at an airstrip in nearby Islita approximately 35-40 minutes away. Please indicate if you are interested in the house, the apartment, or both. Considerations may be made for groups of larger than 12 on an individual basis. Our home is the culmination of a dream of three families in Boulder, Colorado that wanted a safe, serene yet adventurous tropical home to take our kids for some quality family time. Convenience to beach, shopping, restaurants and activities was important, as well as, our privacy from corporate development and resorts. We think we achieved that here at Ventana Del Mar. We took several years before choosing Carrillo as a location to build our vacation home. We flew the whole western coast of CR looking for a protected bay without commercial development. Additionally we wanted the convenience to WALK everywhere. To restaurants, groceries, beaches, etc. A car is nice, but not necessary. Fishing is usually fantastic. We've regularly caught Mahi Mahi, Yellow Fin Tuna, Sailfish and Marlin. Snapper and Snook on shore. Our caretaker (Gerado) will prepare the best ceviche you've tasted with any bounty you catch. Howler Monkeys are always an entertainment early in the morning (6 a.m.)Geckos and Iguanas are always around for amusement. Luis Angel will bring the horses right to the door if you want to do some riding. Boogie boarding at sunset is a great way to finish the day, then bocas and tragos (tapas & drinks) by the pool. Relax and enjoy! Conveniently located within walking distance to groceries, restaurants and beautiful Carrillo Bay. A/c units in every bedroom. Spaciously vaulted with Teak wood paneling and exposed beams. (2) Vaulted with teak wood ceilings. Vaulted with exposed wood beans and teak wood ceilings. We thoroughly enjoyed our stay in this incredibly well-designed house. The open concept allowed the gentle breezes to cool the house. Everyone could be in separate parts of the house and we could always see and communicate with each other. We didn’t need the air conditioning at all in the lower level. The morning sun shone on the pool which was sheltered by the vegetation in the hotter afternoons. The cool water Jacuzzi was much appreciated after our long walks on the beach. Loved the slide! Every morning we heard the howler monkeys. We enjoyed sitting by the pool watching the magpies, parrots, woodpeckers and kiskadees visit the woods and the pool (for a drink and bird bath). Every night we would hear the chirps of the geckos and then play find-the-gecko on the wall. The iguanas could be seen climbing the trees and running on the roof and the eavestroughs. The lovely and quiet beach was a short walk from the house. The house had all sorts of beach equipment, including boogie boards which we tried one memorable day at high tide. Playa Samara was 1.5 hours walk, and while it had more facilities, it was also more touristy. We preferred Playa Carrillo as we could get most of what we needed at the little stores just minutes from the house. There is a bus between Playa Carrillo and Samara but we didn’t use it as David and Lesdy gave us a ride back to the house when they saw us waiting at the bus stop on the day that we walked to Samara. David and Lesdy were fantastic. They visited us each day to clean the floors and the pool. David arranged all our transfers and tours (he owns Samara Adventures). We especially appreciated his thoughtfulness in rearranging one of the transfers based on the actual flight time (flight arrived early), and to improve the logistics which saved the family 2 hours of travel time! Lesdy was a joy as she helped me with my Spanish each day. They were a fountain of knowledge - thank you so much for telling me about the tide pool. We highly recommend this house, especially with David and Lesdy to take care of you. We loved every minute of our stay at this home! There were a group of 8 of us (4 couples) who traveled to Playa Carrillo and there was plenty of room for all of us. Each couple had their own room as well as bathroom. The rooms were clean and plenty of room in each. The dining table easily sat all 8 of us. The kitchen was well stocked with all of the kitchen supplies that you would need. The pool and outdoor area was very well maintained. It was a short walk to the magnificent Playa Carrillo beach. The beach was beautiful and hardly any people. There is a man at the beach who rents umbrellas and chairs if you didn't want to bring the chairs available at the house. There are 3 restaurants that are a 2 minute walk from the house. All of them were great but Los Delfines is a family run business with great food and cheap beer. There is also a grocery store that is a 2 minute walk away which has pretty much anything that you need. The grocery stores in Samara are bigger and cheaper if you are looking to stock up. We would walk into Samara, it takes about an hour and a half along the beach and then we would take a taxi home.The town itself has everything that you need. The best part of the house, however, were Davis and Leslie. The would answer all of our questions and got us anything that we needed. David was awesome at getting us any fish or shrimp that we needed as well as hooking us up with any of the excursions that we wanted to do. They keep the house and yard spotless. Thank you so much Davis and Leslie!!!! We would return to this house and area anytime! The villa is in a great location with shops and restaurants within walking distance. We loved the pool and the open air living space and enjoyed meeting all the local wildlife that visited the garden! Ample space for our family of 11 to spread out for privacy and ample space for us all to congregate in the great room. The pool was perfect for everyone from age 2 to 65. There is no shallow end aside from the steps so caution with the little ones. The slide and palapa bar a bonus feature for the pool area. Air conditioning in each bedroom was a necessity with the heat and humidity. The caretaker next door was available for any issue that arose. The beach was wonderful, a short five minute walk from the house. The owners provided some boogie boards as well as other water toys. Groceries and restaurants also a short walk from the house.. Lots of birds and we could hear the howler monkeys in the mornings and afternoons. Samara is a short drive if you need a change of pace, a bit more touristy for souvenir shopping. The perfect place to make memories! As a single mom traveling with my 4 kids (15,17,20,21) and 3 of their friends, finding the perfect space needed was a bit intimidating but we found this wonderful home that worked out beyond my expectations! The bedroom set up was ideal and more than enough room. The outdoor covered dining/living room area was the centerpiece of our evenings. The pool was gorgeous and a must we learned pretty quickly! We cooked several nights and always breakfast and never had to improvise as everything we needed was there. The grill out by the pool bar area was great and we even cooked our fresh caught Mahi Mahi one night! Washer/dryer was a nice bonus as well. Boogie boards and chairs provided great beach entertainment. We can’t say thank you enough to Gerardo! He was always there for advice, recommendations and a friendly smile! Forgive my informal review as I’m typing from my phone on a plane in Miami! Couldn’t wait to tell everyone about our fabulous little getaway home! Thank you Michael Wood!!! It was a real nice experience to stay at this place. The house is incredible, the Carillo beach is perfect and Gerardo (te gardener) is very helpfull. Zip Line Canopy Tour, Ultra-light Helicopter tours, ATV tours and mountain biking. Sea turtle viewing, dolphin watching, river kayaking, surfing lessons. Day trips to volcanoes, cloud forest and nature preserves.